While America imports more than 50% of the petroleum consumed in the US, we actually have a surplus of coal and natural gas. Please realize that most of the petroleum is utilized for transportation, while coal, natural gas, nuclear, and renewable energy sources are utilized for space heating and electricity. Very little wind & solar renewable energy sources are used for transportation, but instead offsets the amount of coal and natural gas consumed in the US for space heating and electricity. Renewable energy resources must compete against the world’s cheapest energy resources (coal and natural gas) to generate electricity. By using natural gas and electricity in the transportation industry we hope to use more domestic energy resources and drive up the demand for electricity, which will cause the renewable energy resources to have a better Return On Investment leading to their greater use. We will be ENERGY INDEPENDENT and GENERATE MORE ELECTRICITY VIA SOLAR AND WIND POWER IF NATURAL GAS is used for TRANSPORTATION and NOT USED to generate ELECTRICY! WE SAY: We have a SURPLUS of non-transportation energy resources, but we must import oil for transportation energy. All efforts should be made to increase the amount of domestic energy (fossil or renewable) for transportation. In the following two figures and tables, you should see how the different energy sources are utilized to produce electricity, heating, and transportation. 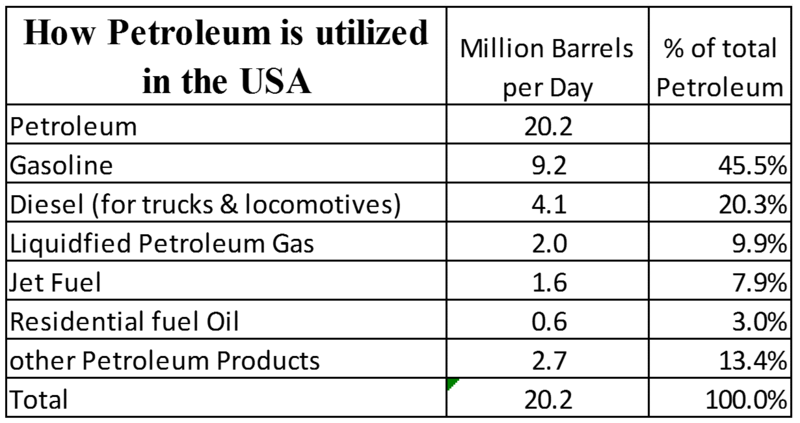 As you can see, even though we have an overabundance of coal and natural gas, we import 30% of our energy needs in the form of petroleum which is use to make liquid fuels for transportation. Only 0.91% of our energy comes from solar and wind energy, but yet the President and the liberals have invested many $billions and want to spend even more. As you can see, other countries are far more dependent upon Persian Gulf oil than we are; they should provide the security for its safe passage through the Persian Gulf, not us. America has the most asinine policy toward coal and energy. If you want the US to generate more energy via renewable energy sources, utilize as much natural gas as possible to power cars, trucks, and airplanes. The price of electricity will climb until the renewable energy sources are feasible and have a better return on investment while reducing America's dependence upon foreign oil. American politicians have discouraged the use of the cheapest energy source in this country to the point that coal is being shipped to China. Does this make any sense? Rather than burning coal in the most regulated and most filtered power plants in the world here in America, we ship the same coal thousands of miles to the least regulated and least filtered power plants in the world! The carbon footprint produced by one ocean going coal barge alone may offset all of America’s solar energy investment for one year. As a result of America’s energy policy, China can generate electricity cheaper than America and thereby out compete us on energy intensive products (such as steel, which is produced from coke); thus sending jobs to China; while producing much more pollution in the world than had the coal been burned in US coal fired plants. In 2011, the US exported 107,259 thousand short tons of coal. This was the highest level of coal exports since 1991. Most of the coal was exported from the East Coast to Europe to make Coke and electricity. WE SAY: Since the coal is here, we burn the coal here, and keep those jobs here!